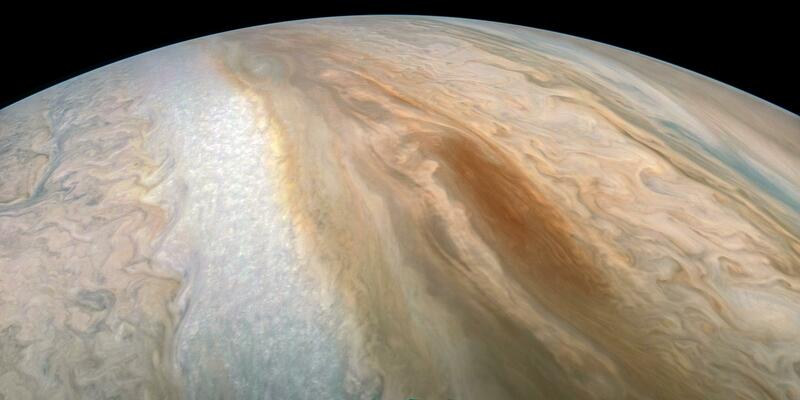 Astronomy Now - Jupiter probe captures intriguing look at a ‘brown barge’ | Astro What? So-called “brown barges” are cyclonic storms in Jupiter’s atmosphere that are typically found in the giant planet’s relatively dark North Equatorial Belt but they are occasionally spotted om the South Equatorial Belt as well. The storms are difficult to detect visually because they tend to blend in with the surrounding areas. But occasionally, the darker material in the belt recedes and brown barges become easier to see against the lighter background. This image, capturing a brown barge in the South Equatorial Belt, was captured by NASA’s Juno Jupiter orbiter on 6 September as the probe made its 15th close flyby at a distance of 11,950 kilometres (7,425 miles) from Jupiter’s cloudtops. The color-enhanced JunoCam image was processed by citizen-scientist Kevin M. Gill.